We've heard it from enough of our partners to know it's true: selling custom lanyards is a complicated matter. With so many colors, styles, sizes and end fittings to choose from, it can be hard to ensure that your customer is getting the right product at the right price. Plus, many suppliers have a 24-hour wait on sending out design proofs — who has that much time to wait? To solve those problems, we're happy to announce the release of our innovative Design-A-Lanyard tool, which will change the way you design and sell custom lanyards. We've turned the custom lanyard process into a seamless experience: our tool allows you to select your lanyard features, upload artwork and view your finished design instantly, all without ever leaving the tool. Embed the tool on your own website to drive web growth. You can choose the default options, including lanyard style and color, in the tool and set your price margins to whatever makes you comfortable. Use the tool as an internal quoting tool. 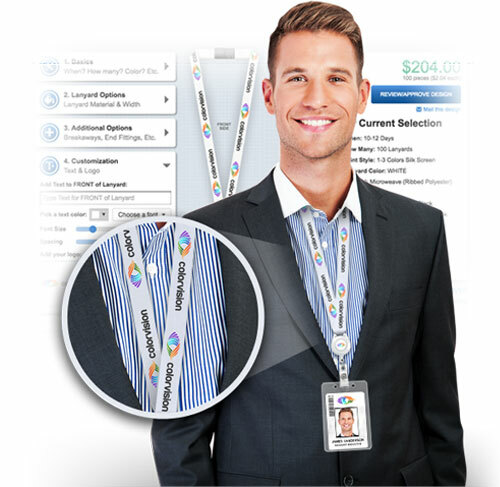 You or your employees can use the tool in-house to design lanyards for your customers. Email the customer a PDF proof, or share a link where the customer can view and edit his or her design. Proofing or selling: Use Design-A-Lanyard your way! The features and administrative tools in Design-A-Lanyard make it easy to use the tool the way you'd like. We designed the tool to serve two different functions: it can be an internal quoting tool, drastically simplifying what can be a complicated custom product, or it can be an external sales tool that you place on your website to drive web sales. You decide!